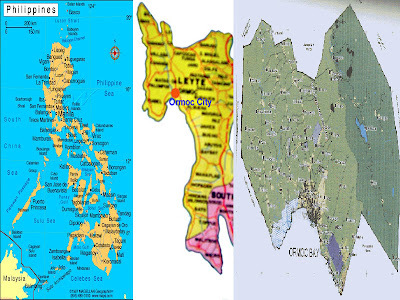 This is the Philippine map showing the Island of Leyte where Ormoc is a chartered city. A chartered city reports directly to the Office of the President and does not pass by the governor of Leyte. 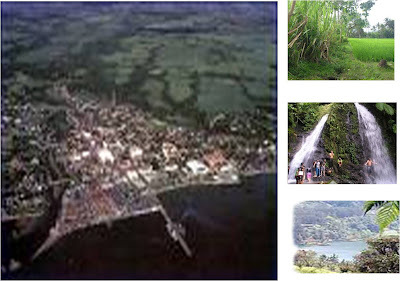 Ormoc is endowed with so much natural resources: sugarcane, ricefields, old growth forest, abundant water, geothermal energy, industries, commercial establishments and a friendly people. Most TCF Community Sewing Centers are in agricultural villages. But, let us start from the beginning…. 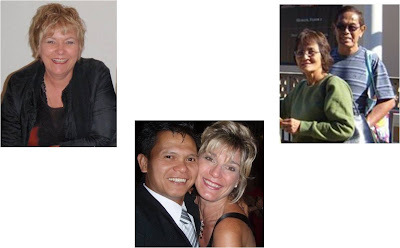 In January, 2007 Carol Hanlon and Mel Liley – Rom whose husband is a Leyteño, came to Ormoc for a product scouting mission and product development opportunity. They stayed in the house of Dr. Jun Yrastorza and the late Glenda Yrastorza. Upon the request of Carol, Dr. Yrastorza gathered a few NGO managers to their house where Carol explained why they were in Ormoc. Hearing many women interested and are being trained in sewing, was enough for Carol to take to Australia with them. That was how these all started. 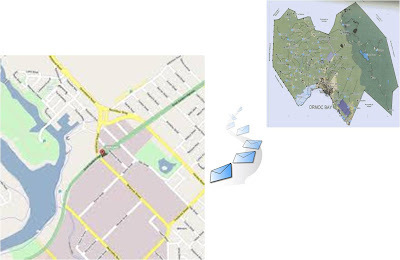 Emails flew rapidly from Belmont to Ormoc to Belmont – almost daily. We then found out that Carol and Mel upon their return from their first Ormoc visit, were busy soliciting for donations to be sent to Ormoc, Philippines. In Australia Carol and Mel busied themselves in telling people to donate through mass media, through friends in their organizations and through the Rotary Club. 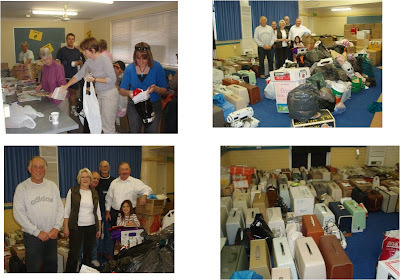 Wonderful Australians came to lend a hand to receive the awesome donations! Wives, husbands and their children came to help pack the voluminous donations that poured in. 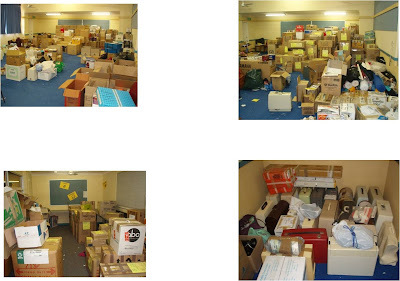 Here are all the donations… awesome, just awesome. We can’t thank you enough! So much work done for the Ormocanons…. by the Australians…. And they finished loading them in the van way into the night…. Back in Ormoc Dr. Yrastorza & Jean Justimbaste went to the different villages where sewing trainings have been conducted and introduced the TCF project to them – their responsibilities as well as the responsibilities of TCF. 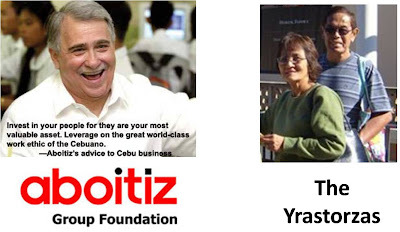 Through Jon Aboitiz, Dr. Jun Yrastorza’s cousin, the Aboitiz Group Foundation provided the funds for the shipment of one 40-ft container van from Perth – Cebu – Ormoc. 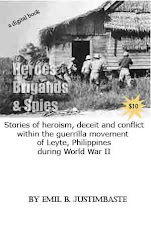 The Yrastorzas lent TCFOrmoc the money to pay for the customs duties in Cebu. 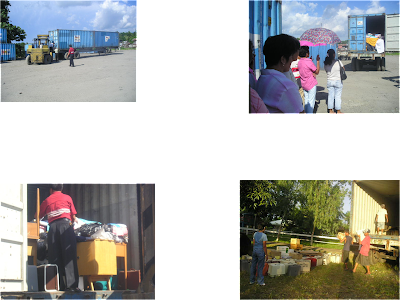 Some women were present on the arrival of the goods and went with the van to the residence of Vicky Larrazabal-Locsin. Former govt officials in their own right and good friends of the Yrastorzas, Toto and Vicky Locsin lent their big family hall as temporary warehouse of the donations from Carol’s group – TCFWA. We did not waste time and distributed the goods the same day it arrived. The distribution lasted for 7 days at the Locsin Hall and transferred to the medical clinic of Dr. Yrastorza. For a whole year, we were still distributing. … and the Community Sewing Centers started producing…. All 22, then 25 and now 30 of them. 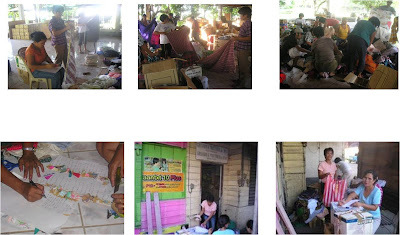 In November, 2009 twenty-two (22) of the Community Sewing Centers were turned over to the Metro Ormoc Community Credit Coop. With Dr. Yrastorza already based in the U.S. it was the best move. 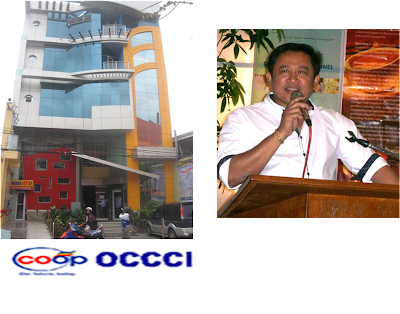 With OCCCI, it was hoped that the Community Sewing Centers would expand and develop their businesses better. This was in time for the arrival of the 2nd batch of donations which will be presented by Joe. Currently, TCF Ormoc has a new partner in the Eastern Visayas State University (EVSU). EVSU has the capability to provide more trainings to TCF beneficiaries and it has the technical people to provide these trainings. Future Plans: TCF Ormoc is right now managed by a Project Management Team composed of PFI/Dr. Yrastorza, OCCCI and EVSU. It is planned that as soon as BPW Ormoc shall have been accepted as a Club by the International Federation of Business and Professional Women, TCF then will be turned-over to BPW Ormoc. The dream is to establish a Center for Entrepreneurship at the EVSU Ormoc Campus where TCF women and others specially the younger generation, may hone their sewing and craft talents for them to use in their own businesses. MY HEARTFELT THANKS to BPW Belmont, TCF Western Australia, Carol Hanlon and Shirley Lancaster. Never in my dreams have I expected to be able to travel outside of my own country, the Philippines if not for - foremost, Carol Hanlon. To her I am grateful. However, without the support of all the women in BPW Belmont, BPW Perth and TCF Western Australia everything couldn't have happened. To BPW Belmont, thank you so much for facilitating my scholarship with BPW Australia's Agnes Robertson Fund to be able to attend the International Conference of Fashion Incubators in Perth. It was my honor to have presented the TCF Ormoc project in the conference in behalf of Dr. Jun Yrastorza and the other NGOs who, in one way or another have partially or fully helped the project. To Shirley Lancaster and husband, my heartfelt thanks for welcoming me to their wonderful home. Shirley and her husband have been awesome hosts to me. My thanks to her too for bringing me to the home of my kababayans - the Roms. BPW Belmont and BPW Perth, you are all great! Thanks for pursuing the 3rd batch of donations for TCF Ormoc. 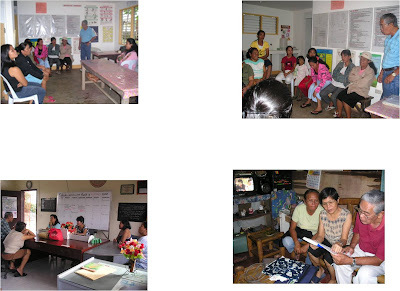 19 Community Livelihood Centers in 17 barangays (villages) in Ormoc. We are managed by a Project Management Team composed of Dr. Gregorio Yrastorza, Jr., OCEF; Jean Justimbaste, PFI; Marlyn Valenciano, ECLIPSE; Nieves Coca, ORVEMPCO; and Xerxes Solon, LEYAN. The invitation from Carol Hanlon to attend the International Conference of Fashion Incubators (ICFI 2011) in Perth, Western Australia came to as a surprise to me. Was I glad I attended that conference (September 11-13, 2011) and my warm gratitude to Carol Hanlon for being my biggest supporter who really did a lot to get me a scholarship for this travel. I learned a lot from the conference - talk of opportunities for women in the villages! There were hitches along the way, of course! I had to re-book my ticket and take the Tacloban-Manila flight my visa arrived only at 2:00 o'clock in the afternoon and I was booked on the 3PM flight from Cebu-Manila. Thank you so much to a Jane at ToGo courier - the official courier of the Australian Embassy in Manila. She made it happen for me. Thank you to OCCCI staff Jane Jumao-as and MaryAnne Joriza they are both wonderful ladies who helped me book my e-ticket for Carol to reimburse later. And of course thank you to Joe Mosquite, OCCCI CEO who approved the facilitation of my e-tickets as requested by Carol. Thank you to Spanky Muñoz who, as always, is always there whenever I need someone's help. God Bless you, Spank! And most of all thank you to my husband, Emil for allowing me to travel and took the responsibility of taking care of my ageing father. Carol is in Helsinki and was interviewed by a reporter there. "I'm in Asia and the Pacific Incubator Network. The main focus of my work is fashion and design promotion. Example, we have 29 sewing center network in the Philippines. I participated in the previous corresponding forum, which was held in Brazil two years ago. It impressed me. artisans are incubators for new and globally. For example, Africa has a lot of interest in them. My passion is to help women micro-enterprises in developing countries. It will be interesting to see how the fashion industry artisans and small entrepreneurs operating in Finland. Fashion entrepreneur is often left aside - our network to help in other areas such as garment and textile sector. I came to Finland at my own expense, and I'm going to take advantage of the journey, visit to St. Petersburg, Moscow and Berlin. I will return to Helsinki, an international business women's conference a couple of weeks. " New York, 24 February 2011 — The UN today celebrates the historic launch of UN Women, its newest organization, with an evening including luminaries from the worlds of politics, entertainment, business, the media, music and film in the UN General Assembly Hall. UN Women, formally known as the United Nations Entity for Gender Equality and the Empowerment of Women, combines four previous UN bodies and represents the United Nations’ most ambitious effort ever to accelerate actions to achieve gender equality. Around the world, supporters of women’s rights have heralded its debut. The Secretary-General appointed former Chilean President Michelle Bachelet to be the first Executive Director of UN Women. Calling the launch the first of many important milestones in the global pursuit of gender equality, she emphasizes that the decision to establish UN Women reflects ongoing frustration with the slow pace of change. UN Member States unanimously agreed to create the new organization, following longstanding advocacy by women’s activists. UN Women will support individual countries in moving towards gender equality in economics and politics, and ending the worldwide phenomenon of violence against women. It will assist in setting international standards for progress, and lead coordinated UN efforts to make new opportunities for women and girls central to all UN programmes for development and peace. Ms. Juju Chang, news anchor for ABC’s Good Morning America, serves as emcee of the celebration. Other speakers include UN General Assembly President Joseph Deiss; the President of the UN Women Executive Board and former Foreign Minister of Nigeria, Ambassador Joy Ogwu; Nepalese activist Bandana Rana and former Commander of the all-female Formed Police Unit in Liberia Rakhi Sahi. CNN founder and Chairman of the UN Foundation Ted Turner urges men and the private sector to get involved in achieving gender equality. Actress Geena Davis highlights the role of the media in promoting positive images. The singer Shakira has offered a special message emphasizing the importance of education. The programme concludes with the performance of the song “One Woman,” which was written for the occasion, with lyrics by Beth Blatt, and music co-composed by Graham Lyle and Clay. So many things happening everyday! Complete a separate registration form for each delegate. Copies of registration form are available on the BPW NZ Website (www,bpwnz.org.nz). Please retain a copy for your records. The conference aims to further professional development and to promote best practice across the industry. The International Conference of Fashion Incubators will present challenging speakers at the forefront of the fashion industry as well as a range of practitioners willing to share their experiences and expertise, exhibitors and great opportunities for global networking. business training & mentoring is provided through the delivery of projects that include workshops, online mentoring, events and exhibitions. Buying missions are also co-ordinated to numerous global trade fashion events. WHO WILL ATTEND AND WHO WILL YOUR MESSAGE REACH? The Third International Conference of Fashion Incubators will offer new opportunities for fashion business educators and fashion trade events from around the globe to network, discuss best practice and expand global designer marketing and promotional opportunities. It will assist the growth and development of fashion industry business educators and those that nurture and support emerging designers, as well as elevating Perth on the international fashion stage. Textile Clothing Footwear Resource Centre of WA Inc.
Designedge Fashion Incubator was first launched in 2003 and has since developed to be a retail incubator and more recently a virtual fashion incubator, providing online shops and designer profiles. 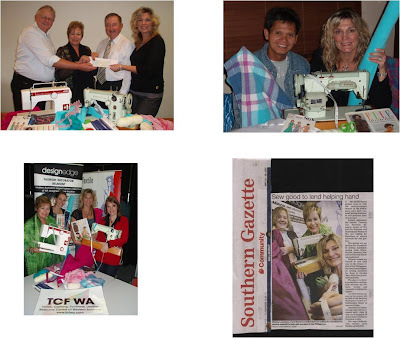 Textile Clothing Footwear Resource Centre of WA Inc. (TCFWA) was founded in 1998 and has developed an extensive range of innovative small business training & mentoring projects for creative fashion and textile micro enterprises across Australia. TCFWA is a nonprofit community based organisation. projects or assists with linkages in the global supply chain to connect fashion designers with global manufacturing, raw materials and global fashion trade and industry networks. their experiences and expertise, exhibitors and great opportunities for global networking. While Carol Hanlon continues with her Textile Clothing Footwear Ormoc Community Sewing Center visits with Boy Sebidos, Christine Della Vedova was conducting interviews with prospective members of BPW Ormoc. It was a pretty tough activity where Christine sometimes turned to me (Jean) for interpretation and somewhat heavy to us who were both emotionally inclined. After the profiling activity, Christine had to rush to the Ormoc City National High School (OCNHS) to speak before 15 high school teachers about BPW. She finished there by about 1:00 o'clock noon of January 12. Then she had to rush to the Ormoc City Community Credit Cooperative Incorporated (OCCCI) for the Third TCF Ormoc Fashion Parade. No time to waste for BPW Belmont girls Carol and Christine. In the morning of January 11, 2011 Carol Hanlon and Christine Della Vedova visited community sewing centers in the next town of Kananga. In the afternoon, they were at the Eastern Visayas State University (EVSU). As in the Ormoc National City High School, Christine gave a talk on being a self-starter and volunteering. This time her audience consists of more than a hundred college students. 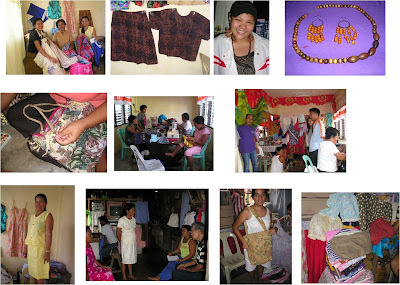 EVSU Ormoc with a few participants from the Community Sewing Centers on Starting a Business. At the end of her talk she presented some business opportunities. One business opportunity is the manufacture of fashion accessories made from wood, bone and resin. This is a business of Faye Maramara, a Cebuana who is now in Western Australia. Another is upholstery business. She is in possession of donated upholstery materials that are waiting for a donee. When this was presented, the EVSU Campus Director Dr. Lillian Estorninos signified willingness to accept the donations. That’s it. Another shipment of donations from Australia will be forthcoming within this year or next year. 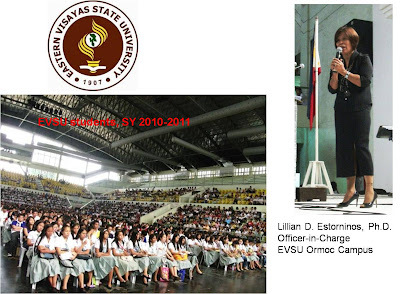 Carol then presented to EVSU, business books which Dr. Estorninos accepted in behalf of the EVSU Ormoc Campus. Dinner time was bonding time for the organizers of the BPW Belmont Ormoc visit. More discussions happened and plans materialized. And that sealed the day for the cast and crew of the BPW Belmont Club’s visit to the Philippines.